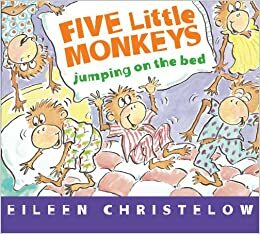 A favorite book and fingerplay that I use with my pre-school and kindergarten kiddos is "Five Little Monkeys Jumping on the Bed". I found that Brittany De Laruelle has a really cute (and FREE) slide show to use with this fingerplay, and I pulled it out this year after we had read the book. 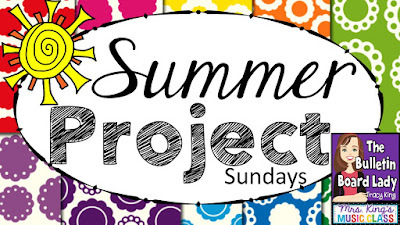 Which brings me to one of (hopefully) many summer projects: Easy DIY Monkey Stick Puppets. When I say easy, I mean SUPER easy. I was walking through Hobby Lobby and found some pre-made little monkeys over in the craft aisle with wood, glass, etc. and they had a ton of pre-made animals, shapes, cars, princesses, you name it. These little guys were $0.67 each. I already had some bigger popsicle/small paint sticks at home. So for $3.35 + plus tax I created a set of monkey stick puppets. All I had to do was peel off the price sticker/plastic piece on the back and hot glue them to the stick. They will be great for my kiddos to take turns holding and bouncing to the steady beat of the rhyme and acting out as the rest of the class performs the fingerplay. 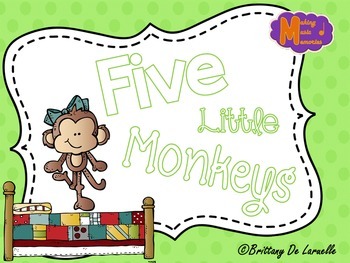 If you aren't familiar with it, you must check out "Five Little Monkeys Sitting in a Tree". Super fun for loud/soft, as the alligator sneaks ups quietly and then CHOMP grabs a monkey out of the tree! These are adorable and they look like they are SO easy to make! heading to Hobby Lobby! Super easy. Basically already put together for you! There are tons of cool things in that section. I don't know how I had never been down that aisle before! LOVE! I saw these in Hobby Lobby this week, but didn't see the potential! Thanks for linking up! Thanks, Tracy! I've done that with so many things. I'm so thankful for my blogger friends who help me see the potential too! I think she would love it! Ellie loved them!